You may have noticed these blue River Star Home yard flags popping up in front yards across Norfolk neighborhoods. In fact, our H1 House on the corner of 30th and Colonial recently became a River Star Home. So what are River Star Homes? 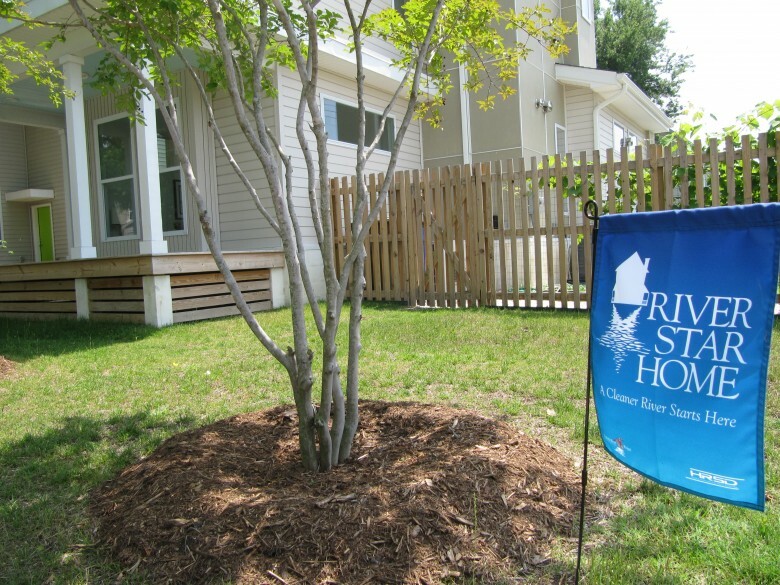 Each River Star Home is part of a free voluntary program of the Elizabeth River Project called….you guessed it: River Star Homes. It’s is a way for citizens who live in the Elizabeth River watershed area to help reduce pollution and restore the waterway. It’s designed to engage residents of the Elizabeth River area in simple practices they can do at home to help make the river swimmable and fishable again. Sounds Huckleberry Finn-ish and we’re into it. 1. “SCOOP the POOP” after our dogs. When pet waste washes into the river, bacteria levels make swimming unsafe. 2. REDUCE FERTILIZERS on our lawns. Over – fertilized lawns lead to algae blooms that choke river life. 3. PROTECT STORM DRAINS from grass clippings, leaves and oil. Storm drains lead to the river. Even leaves add excess nutrients that harm river life. 4. NO GREASE IN SINK Pouring grease down the kitchen sink can cause clogged drains, leading to sewer overflows – and raw sewage in the river. 5. HELP GEESE MIGRATE by not feeding them. Overpopulations of geese mean too much poop in the river – and unsafe swimming. 6. PUMP OUT boat sewage at proper facilities. When boats dump directly into the river, it adds to unswimmable conditions. 7. DON’T FLUSH MEDICINES Treatment facilities can’t remove medicines from sewage. Keep them out of the river by following safe disposal methods. If you’re already doing-or agree to do-the steps above, you can be a River Star Home. It’s free! It’s easy! Sign up here and you’ll receive a beautiful yard flag, a decal and a welcome packet. To learn more, check them out on the River Star Homes website and follow them on facebook here. 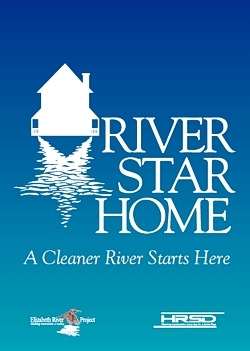 Note: The River Star Homes program is available only to residents of Virginia’s Elizabeth River “watershed” – the area that drains into the Elizabeth River when it rains. There is a map on their website where you can find out if your home is in the Elizabeth River watershed.